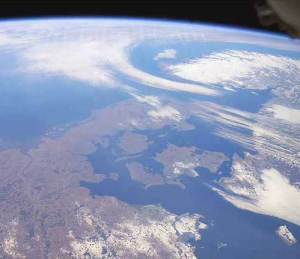 Denmark from space. The island of Bornholm is in the bottom right corner. Islands have played an important part in our family history. 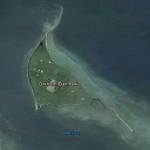 In the Danish language the most common word for “island” is Ø (Sejerø, Strynø). A small island near a larger one may in that agricultural country be regarded as the larger island’s calf – (Strynø Kalv). But in a country made up largely of islands there are a number of words for the same concept (just as the Inuit have many words for snow). A large island is usually a Land (Sjlland, Langeland). Or just a name without a suffix (Fyn, Møn). The name HOLM is one of the words for island: a small island usually, perhaps only a hill in a bog, where the marsh hay is spread to dry. The noun may be made into a verb by adding the letter E. To “holme hø” means to rescue hay from the waters of the marsh by placing it on a holm or mound to dry; but the expression is not common. A holmgang is a duel, traditionally fought on a small island. My mother’s maiden name was Birkholm or Birch Island. This was also the name of the Birkholm ancestral home – a small island south of Fyn. More of that later. 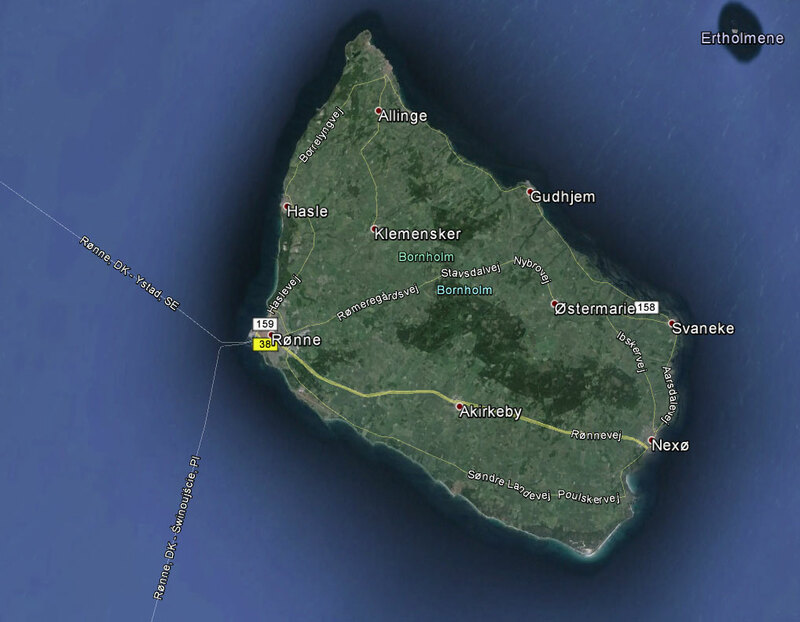 The largest island in Denmark to be called a holm is Bornholm, my father’s birthplace. 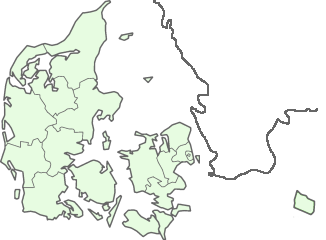 Of Denmark’s 486 islands (nearly 100 of them inhabited) Bornholm ranks fourth in size, after Sjælland, Fyn and Lolland. It contains 588 sq. km. (227 sq. miles – the same size as the Isle of Man) and some 48,000 inhabitants (excluding the trolls, who have refused to take part in the census). Bornholm is an isolated part of Denmark, being 169 km south-east of Copenhagen, 36 km from Sweden, 90 from Poland and 82 from Germany. 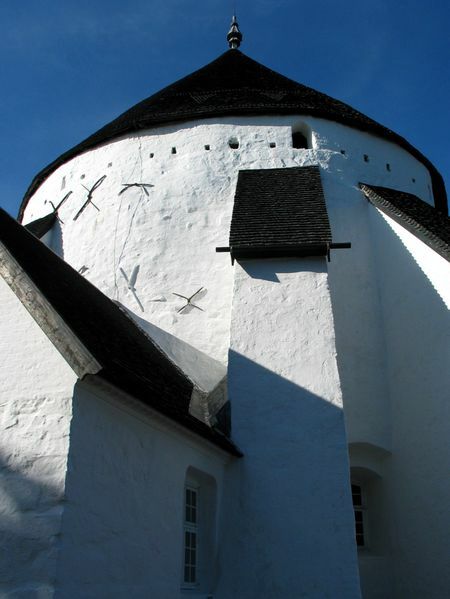 It is famous for its pottery, round churches, grandfather clocks and smoked herring. Once upon a time, in the very long ago, Mother Eve was bathing her children in a stream; they had been playing in underground caves and were filthy. She was half-way through the task when she heard the Lord God coming in the distance. Being ashamed to let him see the dirty youngsters she hid them underground and stood the others in a line for inspection. When God came up he saw only the clean ones and complimented her on their fine looks. “And is this all your family?” he asked. She told him that it was. 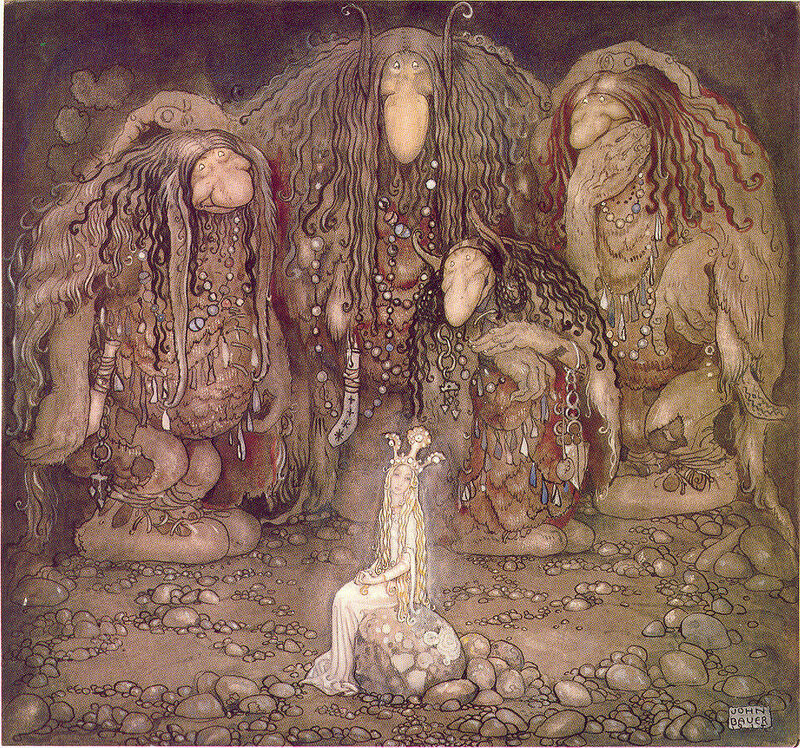 But she couldn’t fool the Lord God, and for her sin the dirty children were made to live forever underground, where they became the trolls of Bornholm. So now we know where it all started. To this day, if you are visiting on Bornholm, and are out at midnight, very quietly watching one of the old iron age burial mounds, you may see the earth rising on glowing pillars and the trolls feasting and dancing underneath. But as soon as the revellers become aware of you, down will come the mound, and all will be dark and silent. Some 10,000 years ago, when the last ice age was coming to an end, it was almost possible to walk dryshod from Denmark to Sweden across the Kattegat, as Jutland and Skåne were joined to each other, and there were rivers where the Great and Little Belts and the Sound are now. The Baltic Sea was the Ancylus Lake, and the rivers were the only outlet to the Atlantic Ocean. The ice however was melting in the Norwegian mountains and torrents of water were pouring down the rivers of Sweden into the Lake, causing its waters to rise and churn its shores. A bridge of rock joining Skåne to what is now northern Poland protected the lowlands of Denmark from the swelling waters of the Ancylus Lake. For a thousand years the waves beat against the rock until even the hardest granite had to give way. The water broke through in the south next to present day Poland, and in the north near what is now the Swedish shore. The floods swept over southern Denmark, widening the rivers and turning them into broad belts, broad enough for large ships to navigate. The higher land became the islands of Denmark. The few stone age inhabitants who had been living on the rock bridge saw their homes swept away. They climbed to the hills, hoping that at least some of the granite and sandstone would continue to give them shelter. Part of the bridge, tougher than the rest, resisted the swirling waters and stands to this day, its rocky coastline in many places rising perpendicular out of the deep waters of the surrounding Baltic. 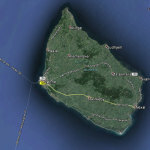 That section of granite and sandstone, covered by a layer of earth of varying thicknesses, is the Island of Bornholm. During the Iron Age many ships called at its various ports, carrying goods back and forth between central Europe and the Scandinavian peninsula. The Gudhjem-Østerlars area on the north-east shore became particularly prosperous. By the year 1000 A.D. the island was under the Danish crown and its affairs were controlled by a governor appointed by the king. The population at the time was probably less than 10,000. Christianity came in the 11th century and many of the present parish churches were built 1050-1150, usually on hilltops that had been sacred to Odin and Thor. Among those still existing are four heavy, round, stone churches, with a place of worship on the bottom floor, a storehouse on the second (for goods being traded) and a lookout tower above. From the four churches one could see the whole coastline of the Island; this is not possible today with a forest covering the center of the Island. The buildings apparently also served as arsenals and as places of refuge in wartime. Over the centuries the Danish government often regarded Bornholm as expendable. At times the king mortgaged the Island to Lübeck or to the cities of the Hanseatic League or made it a fief of the Archbishop of Lund, without consulting its people. Poverty and malnutrition made its population a prey to plagues such as the Black Death. Thousands died. During the wars with Sweden in the 17th century Bornholm was passed back and forth between the two countries, and was bled dry to pay for the ambitions of the monarchs. In February 1658 it was ceded to Sweden along with Skåne, Halland, Blekinge and Bohus. The taxes levied by the Swedes added to the general hard times. 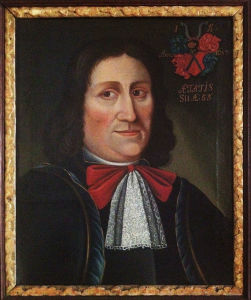 In December of that year a small group of Bornholmere under the leadership of Povl Anker, minister in Hasle, and Militia Captain Jens Kofoed assassinated the Swedish governor, and on December 21 a number of the leading men of the island sailed to Copenhagen in an open boat and formally handed their “land” back to King Frederick III. Since that time it has remained a part of Denmark. The traditional speech of Bornholm is usually regarded as a dialect of Danish, but since it contains hundreds of words peculiar to the Island some writers have considered it a separate language. are being homogenized throughout Denmark. The Bornholmere are losing their individuality and are becoming indistinguishable from the other five million Danes. They are simply speaking Danish with a (more or less) Bomholmsk accent. But in 1980 an uncle, in his eighties, introduced me to a contemporary with words that no citizen of Copenhagen could understand. A few words about the Danish alphabet. A is pronounced as in fat or in father, never as in fate. E is somewhere between the E in get and the EE in beet. There are no silent vowels. I is pronounced like the EE in beet, never as in bite. Long O is pronounced as in rope, short O as in got. (Before the letter L the O is always short. The letter L in Holm is pronounced – softly, like the French L.) U is like the OO in boot, a pure sound, never as in you. To make the sound of the letter Y, purse the lips as in OO and try to sound EE; the French U and the German U have a similar sound. Æ is pronounced as the A in fate, but with a purer, rawer sound. Ø is pronounced like the French EU; the nearest sound in English is that of the U in hurt, the I in girth or the E in pert – but be careful not to sound the R.
Å has two sounds, ‘oh’ and ‘awe’. Prior to the 1940s it was written as a double a (as in Faaborg). In the Bornholmsk dialect the sound ‘awe’ is written Â. AU (as in Tante Laura) is pronounced OW. Some of the consonants may be troublesome. R is pronounced like the German R – a guttural sound made in the throat; we make that sound when we gargle. J is pronounced like English consonantal Y. The sound of the English J is written DJ. G in the middle of a word is sometimes given the sound of a glottal stop; for instance Jørgen is pronounced Yør’en.